I have an Officejet 6000 printer. I only want to print in black so have replaced the black cartidge. The colour cartridges are empty. I'm not able to print, is this because the colour cartridges are empty? Yes, it's often the case with colour inkjet printers like the HP Officejet 6000 that you must have all of the four separate ink cartridges installed with at least some remaining ink in order to print in any colour. Sometimes, it may be possible to override this setting and print in black only but this will depend on the printer model. Please consult your Officejet 6000 printer manual to see if this can be changed in the settings. Alternatively, please contact HP for technical support. I have an HP Officejet 6000 and I'm currently using a HP 920 black cartridge. Will the HP 920XL still fit into my printer? Yes, the HP Officejet 6000 uses 920XL ink cartridges. The black cartridge can either be HP 920 or HP 920XL. The only difference between these two black ink cartridges is the amount of ink contained within each cartridge (HP 920XL is the higher capacity black). Unfortunately, I've had to throw out my HP 930C ColourJet printer. I say unfortunately because replacement ink from yourselves was so reasonably priced and the printer itself was so frugal in its use of ink. I have bought an HP OfficeJet 6000 and am disturbed to find that replacement ink cartridges are three times the price of those for my HP 930C. I've had fantastic service and quality ink from Cartridge Save and am reluctant to move to another supplier. Can you supply remanufactured ink cartidges for my HP OfficeJet 6000 rather than HP original ink? Replacing your Officejet 6000 ink cartridges doesn't need to end up being an unpleasant experience. Buy your HP 6000 inkjet cartridges from Cartridge Save and you can save time and money! We work hard getting the best prices from our suppliers and passing those saving on to you. By all means, shop around but you'll find the Cartridge Save offer an incredible combination or great prices, excellent customer service and no hidden charges. Add the network-ready HP Officejet 6000 to the office and get laser-quality prints minus the hefty price and expensive operating costs. This Energy Star printer uses less electricity than laser printers while producing comparable print quality. It boasts an impressive speed of 32 ppm for black and 31 ppm for coloured. The ink is excellent and guarantees no fading. The only issue with this device is paper jamming when using different types of media. The HP Officejet 6000 is a reliable and robust workhorse, but it is not bulky. This compact solution also features user-friendly buttons. It has an input capacity of 250 sheets and has an automatic paper-type sensor. Boasting a monthly duty cycle of 7,000 pages, this network-ready printer uses wired Ethernet connectivity. With the HP Officejet 6000, offices can save a lot of money. It uses 40% less energy than laser printers. It also helps save the environment, as HP now uses fewer materials for the packaging, and the cartridges are easy to recycle. The HP Officejet 6000 uses individual ink cartridges, which are less expensive to replace. 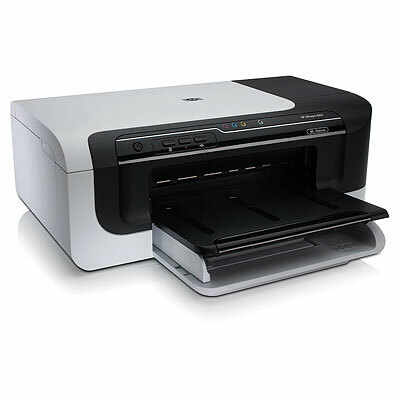 Unlike other printers, the HP Officejet 6000 does not have Wi-Fi and is not compatible with Windows 7. There are certain troubles with the paper feed of the HP Officejet 6000; some users are frustrated by paper jams when using the duplexer or printing on mailing labels.